Airflow regulating dampers adjust airflow to provide either a fixed balanced basis or variable via opening and closing under controlled conditions. They are crucial in air control systems for a variety of applications and Alan Williams & Co stock and supply a wide variety of flow regulating devices suitable for any scale or complexity of system, from domestic and commercial applications to industrial process plants. Many standard sizes are available from our stocks when collection is critical or bespoke options made to order on quick delivery at similar prices to our stocked units. 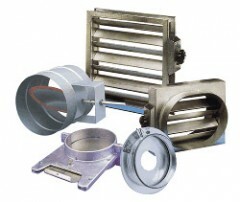 Alan Williams & Co supply a complete range of air flow control dampers and valves for all types of industrial, commercial or domestic applications.